Infused waters don’t have to involve fruit! This vegetable and herb infused water is as flavorful as it is healthy. Cucumbers help to reduce bloating, jalapeños increase your internal temperature and metabolism, and mint can help with digestion and relieve headaches. You can practically taste the health properties of this green-powered water as you sip it! To de-seed a jalapeño, cut off the pepper’s top, then cut the pepper in half. Wear a latex glove or cover your thumb with plastic wrap, and run your thumb down the length of the pepper, removing all seeds and the pith. Combine the ingredients in a container and cover with cold water. Infused for 4-24 hours in the refrigerator. Longer infusion times will result in stronger flavors. If you are worried about this infused water recipe being too spicy, you can reduce the amount of pepper you add. However, mint and cucumber have amazing cooling properties in the mouth (and body), and they work well to balance the spiciness. 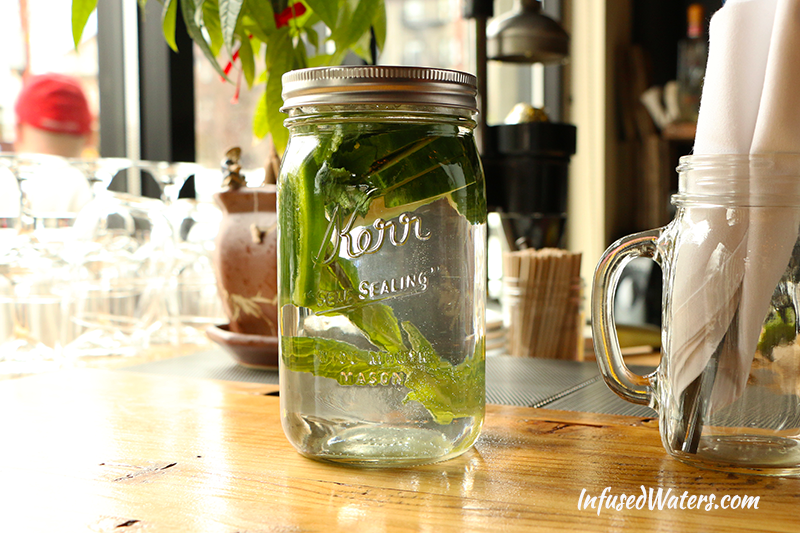 This infused water tastes delicious with East Asian food, which uses similar ingredients. I took the picture for this post at my favorite Vietnamese restaurant. 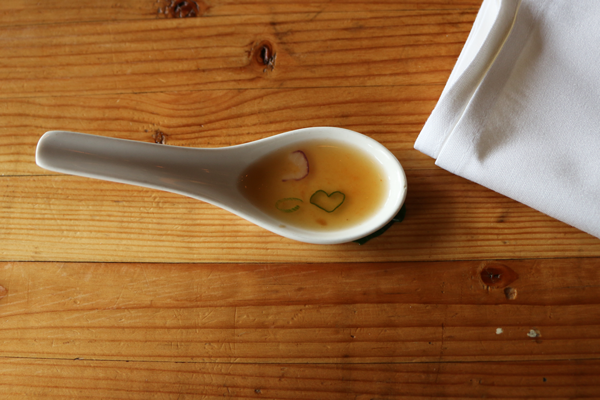 When I looked down at my spoon of pho, there was a sweet little surprise for me! I imagine this would taste great with Pad Thai. I think the herbs and cucumber would balance the Thai spices — give my tongue a bit of relief actually. Thanks for the recipe! I love infused water! I don’t think I drink a single glass with our some fruit or veggie in it. But Jalapeno!!!! Never thought of that, and can’t wait to try it. 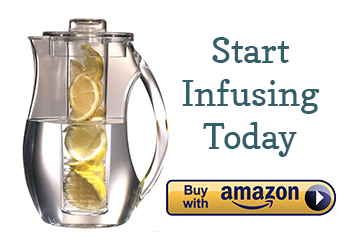 I was initially looking for any benefits of drinking infused water? Like cucumber reducing bloating and Jalapeno boosting metabolism but what about vitamins and nutrients? Just wondering if there is a way to determine how much nutrition actually comes from infused water? I’m going to begin infusing water today, this highly interests me! This trend recently caught on at work with various water jugs popping up all over the place. I’ve not seen this variation yet, but I was able to walk outside and grab what I needed off of the patio, and will be drinking a batch by this afternoon! I had this at a bar in Montreal mixed with lemonade and vodka. It was AMAZING! So freshing! I love cucumber water with a squeeze of fresh lemon. I can’t wait to try this with jalapeno – what a great idea! Thanks for the recipe. That’s the way I do it and love it!! Just wanted to mention jalapenos, or any spicy foods lowers your internal temps. Hence why spicier foods arent eating more near the equator. It thins the blood and dilates blood vessels allowing the body to cool more efficiently. Bad for people that have clotting issues or are on thinners. Also, in industrialized nations, dehydration is a rather rare incidence, esp with seditary lifestyles. Edit**^ its why spicier foods ARE eaten more near the equator. Thankyou I’ve been looking for this recipe for several years..
A chef that I used to work with, swore by this..
I’m looking forward to try and guess detox..